Having a pair of well-defined biceps can complement your short-sleeve shirts and tank tops. Increasing muscular definition in your biceps involves developing your bicep muscles through strength training, while decreasing your body-fat percentage to give your arms a leaner appearance. Getting enough protein is an important part of gaining muscle mass, but protein supplements such as shakes are not necessary for building muscle. Including targeted-biceps exercises in your workout routine, while modifying your diet, can help you get ripped biceps without the use of protein shakes. Perform arm-focused strength-training workouts two times per week to build muscle. Include exercises to activate your biceps and triceps. 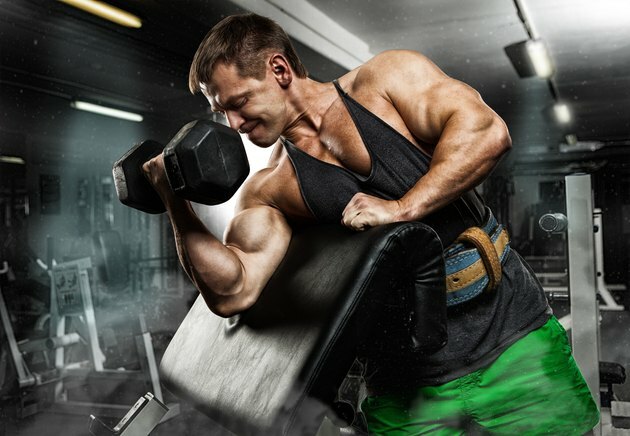 Perform exercises such as dumbbell curls, barbell curls and concentration curls for biceps. For triceps, do barbell presses, triceps overhead presses and body-weight dips. Execute each exercise for four sets of 10 to 12 repetitions. Lift with moderately heavy resistance to encourage muscle development; you shouldn't be able to perform more than 12 repetitions. Engage in cardiovascular intervals four days per week to help burn off fat deposits that rest on top of your muscles. Walk on the treadmill for two minutes, then sprint for one minute, repeating this cycle for 30 minutes. Perform cardio intervals on the elliptical machine, treadmill or stationary bike to add variety. Make adjustments to your diet to help improve your results. Follow a diet that consists of whole foods in their natural form, such as whole grains, low-fat cheeses, eggs, vegetables, lean meats, skinless poultry, nuts, fruits and seeds. Avoid manipulated or refined foods such as boxed meals, pre-seasoned foods, deli meats, white breads and potato chips. Modify your protein intake to encourage muscle development. Include a variety of natural protein sources in your diet, such as lean cuts of steak, skinless chicken breasts, ground turkey, tuna, whitefish, salmon, nuts and legumes. Try to get 0.73 to 0.82 grams of protein per pound of your body weight per day, suggests the College of the Canyons. Measure your protein sources using a food scale to make sure you are getting enough protein at each meal.